The summer can be a challenging time to grow vegetables in the south. Certain vegetable plants suffer through the hottest days, yet many more thrive! America’s most popular home crops, including tomatoes, corn, peppers, squash, melons, and beans, demand the heat of the summer to produce their fruit. But to get the most productive output from your garden during these months, you’ll want to be vigilant about a few things. First, make sure your plants are getting adequate water. Most plants need 1 to 1 ½ inches each week. Soaker hoses are a great way to deliver this water to the plant through drip irrigation. The hoses allow water to seep out, slowly. This method is very effective because it places the water at the soil level. Evaporation is eliminated, the root zone is soaked, and the foliage stays dry. Next, place your soaker hoses on timers if possible. They relieve you of the worry of having to keep up with this task of watering yourself. An added benefit of automatic timers is the ability of being able to set it to water at anytime of day or night. Besides drought, the other major threat to your garden in the summer is pests. This is one of the reasons, planting warm season crops right after the risk of frost is gone is such a good idea. Many pests common in summer gardens won’t become a big problem until later in the season. By then, vegetables planted early are already beyond the point where they are at the most risk. 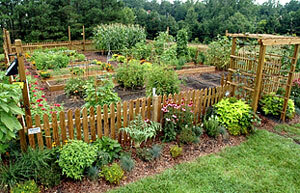 But, for the various pests you may see in your garden, there are several ways to control them. First, inspect your garden for pests as often as you can, to control populations, and minimize damage as early as possible. Be sure to identify the bug you think may be a pest. Actually only about three percent of bugs and insects are considered pests. The others are beneficials (good for the garden) or neutral. Whenever possible, handpick any pests you can. Dropping the offenders into a cup of soapy water will finish the job. This works well for most pests including squash bugs, potato beetles, and cutworms. In my opinion, the second line of defense in pest control is to use the least toxic methods available. This includes organic controls like B.T (Bacillus thuringiensis). B.T is a bacteria that when ingested, paralyzes the digestive tract of certain insect larvae. B.T products are pest specific, so they don’t harm beneficial insects, and their non-toxic to mammals. It can be used right up to harvest time. Next in your arsenal of pests defenses should be insecticidal or horticultural oils. These products are derived from plant and petroleum oils, which kill eggs and immature stages of insects, by blocking their supply of oxygen. Don’t apply these products to plants during times when temperatures are below 40 or above 85 degrees F, or when plants are under stress, such as from drought. Applications at these times can damage the plants. Insecticidal soaps are another good choice, comprised mostly of fatty acids. These products act on contact, by paralyzing the insects. They ultimately die of starvation. These soaps work well for pests such as aphids, and whiteflies, and spider mites. Lastly, but very effective would be the use of synthetic insecticides. These are the manmade chemicals you buy in garden centers, which go by many different names. Most of these products are nonselective. They kill any insect they come in contact with, bad or beneficial. They can also be highly toxic to humans and other animals. If you choose to use these in your garden, be sure to always read and follow the label instructions. The best time to apply insecticides is in the evening. At this time, most pollinating insects have retired for the night, and pollen-filled flowers have closed until morning. By then, much of the toxicity has broken down, and exposure to beneficials will be greatly reduced. The worst time to apply non-selective pesticides is in the morning, once flowers have opened. Applying insecticides at this time is sure to wipe out many lady beetles, soldier bugs, and pollinating insects such as honey and bumble bees. Summer is a great time to garden. Remember, knowledge is power. The more you know about gardening, the more confidence you’ll have to accept and welcome the challenges you’ll face. Just wondering what is the best defense against the Cabbage Moth, white looking butterfly, they fed on my cabbage, broccoli and cauliflower last year. The best defense is to keep the moth from landing on the foliage to prevent it from laying eggs on the leaves. You do that with row cover material–a lightweight fabric that allows air, water and light through but serves as a physical barrier to the moth. You can leave it on the plants as long as you want to protect your plants. But I would remove it once the tender leaves mature. You can find this material at some garden centers but def. online, like from Johnny’s Select Seeds, and groworganic.com. If you find Cabbage worms on your leaves, you can use a biological control called B.t or Bacillus thuringiensis. It’s lethal to caterpillar larvae but harmless to us and other insects, etc. As an organic control, these are the 2 best options.